Have you ever been charged with presenting something you’re not entirely sure you’re an expert on? If so, you probably thought, “Wow, I can’t do this. I’m not an expert.” Then you realize you better learn it fast. People are relying on you to teach, inspire, and perhaps even entertain them. Something important may be on the line; a job promotion, a sale, a product launch, a new service offering, an acquisition, and you need to rise to the occasion. You need to show up uber-schooled and more than proficient. So what do you do? You go to work, you dive in, and you dig deep. 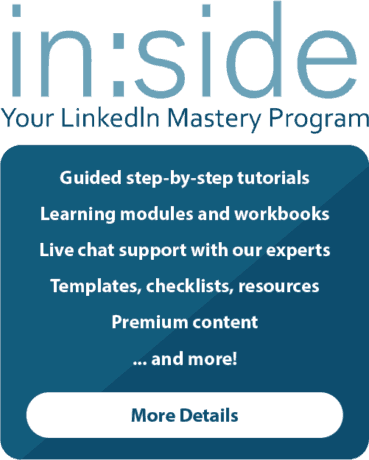 Well for the last four months I have been heads-down working on content for in:side, Your LinkedIn Mastery Program, our new membership site. To say it’s been a labor of love, well, would not be exactly accurate. I consider myself an expert on LinkedIn. I spend 80% of my workweek talking about LinkedIn; practicing, not theorizing. I’ve been using LinkedIn almost daily for the last 13 years. And, over these last four months, I have learned more than I thought. You might wonder, how can that be? Well, when you are trying to teach someone something you have to think about them first. How will they benefit from learning whatever it is you’re teaching? The CFO who never plans on looking for another job and well, so many others of you. I consider myself and our team LinkedIn translators. It’s what we do to fast-track people out of confusion to proficiency and ultimately, mastery. If we continue to learn new things on and about LinkedIn and we’re on it all day, every day, what about you and your team. How do you stay ahead of the curve, proficient, in the know? It’s a fascinating process to continually learn and teach, to translate and apply, and to earn the respect of any group of people (readers, followers, advocates, family, friends and always, clients.) You’ve got to be excellent, passionate, thoughtful, interested, committed, bold, and always looking beyond the obvious, the next stop, the likely conclusion. That’s why my team and I are jazzed about in:side. 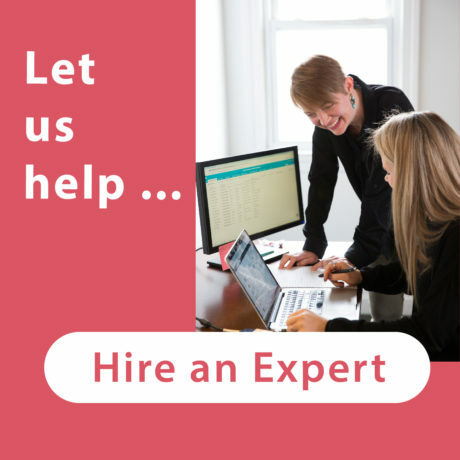 We want you to take what we know and apply it vigorously to your world, your process and your business initiatives. 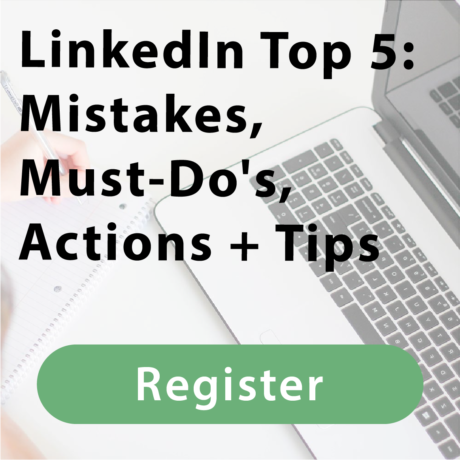 We want, more than anything for you to be successful and leverage LinkedIn to do so. 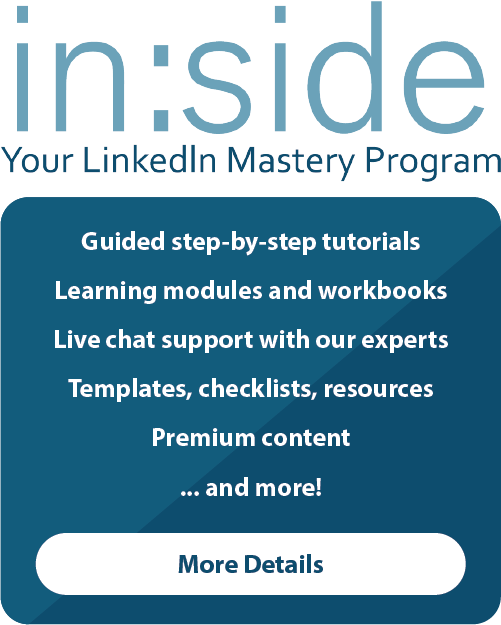 in:side is our collective brain, our best insight and process all designed so you can master and engage on the world’s largest professional network to better your career, build your network, craft your online professional brand, and identify and nurture new business opportunities every day. LinkedIn is the most purposeful business platform available; it’s where you will find business people in a business frame of mind. And, as we know and will discuss, our frame of mind is always where we need to begin. If your organization is B2B focused, sells products and services, has a sales team, needs to hire, markets to key decision makers, sign up to learn more about in:side today. It’s coming soon and you’ll want to be among the first to take advantage of our pre-launch specials. 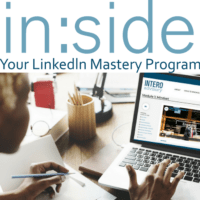 Head over to our website, click “Get Started” and sign up to be one of the first to be notified when in:side, Your LinkedIn Mastery Program is ready to launch.